Accident benefits are an integral part of the automobile insurance compensation system, but understanding what accident victims are entitled to and how to access those benefits can be complicated. This guide simplifies the process and offers best practice strategies so lawyers and paralegals can get better outcomes for their clients. Ever been in an accident? Or represented a client who has been? If so, you likely already know how complex Ontario's automobile insurance compensation system is. Trying to determine – and access – the accident benefits that are available in a given situation can be challenging. That's why Accident Benefits Guide, authored by John McLeish, Dale Orlando, and Patrick Brown is such a timely publication. 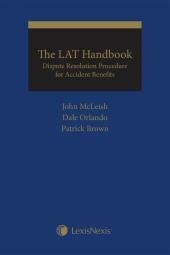 The three authors have leveraged their decades of experience and have provided a practical guide on representing clients during the difficult times after an accident. Accident benefits are an integral part of the automobile insurance compensation system, but understanding what accident victims are entitled to and how to access those benefits can be complicated. Accident Benefits Guide simplifies the process and offers best practice strategies so lawyers and paralegals can get better outcomes for their clients. In Accident Benefits Guide, the authors provide a step-by-step analysis of the accident benefits system, beginning with a look at what types of benefits are available, and then moving on to an examination of how to determine who qualifies for which benefits and practical guidelines for determining eligibility. Organized in an easy-to-use format, Accident Benefits Guide includes many checklists, forms and charts to make finding what you're looking for fast and easy. Accident Benefits Guide is a handy reference that will be particularly useful for litigators and paralegals who are practising in the area of personal injury and accident benefits. John McLeish's practice and that of his firm, McLeish Orlando is dedicated exclusively to representing individuals who have suffered serious personal injuries, including traumatic brain injuries and spinal cord injuries, as well as representing family members in wrongful death cases. He lectures and publishes extensively for various continuing legal education programs on trial advocacy and all matters related to actions for personal injury and wrongful death damages. 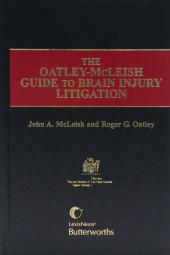 He is a co-author of four texts on Personal Injury and Trial Advocacy. 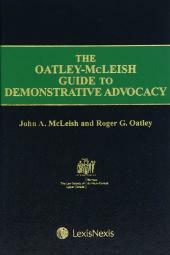 John has served as a past president of the Ontario Trial Lawyers Association. He is named in the National Post's list of Best Lawyers in Canada. He is recognized on Lexpert's list of Leading Practitioners in Toronto as Most Frequently Recommended and is rated AV (Pre-eminent) by Martindale-Hubbell Peer Review. John is listed in the Best Lawyers in Canada for Personal Injury Litigation. He has been named as Toronto's Best Lawyer of the Year in the 2013 edition of Best Lawyers in Canada. As well, he is an elected Fellow of the American College of Trial Lawyers, a North American organization which recognizes excellence in trial lawyers. Canadian Lawyer Magazine chose McLeish Orlando as one of the top five personal injury firms in Canada. Dale Orlando is one of the founding partners in McLeish Orlando. He is a Past President of the Ontario Trial Lawyers Association and is a member of the Toronto Lawyers Association and the Advocates' Society. Dale is Certified as a Specialist in Civil Litigation by the Law Society of Upper Canada. Dale has been selected by peers as "Most Frequently Recommended" in the Canadian Legal Lexpert Directory and listed each year in the Best Lawyers in Canada Registry since 2010. Patrick Brown has been practicing for over 20 years and has dedicated his career to helping those who suffer serious and catastrophic personal injuries. He is a Certified Specialist with the Law Society and has been voted by his fellow lawyers and listed in Best Lawyers Canada and Lexpert Lawyer Rankings. Patrick was awarded the Active Transportation Champion of the Year Award by TCAT and awarded the Distinguished Service Award by the Ontario Trial Lawyers Association and is their Past President.